UpdateStar is the program that lets you stay up-to-date with all of your personal software you are using on your computer. This way you make sure to always use the most up-to-date software, maximizing your every-day user experience. UpdateStar covers all of your freeware, shareware, demos, commercial software, and includes special offers. 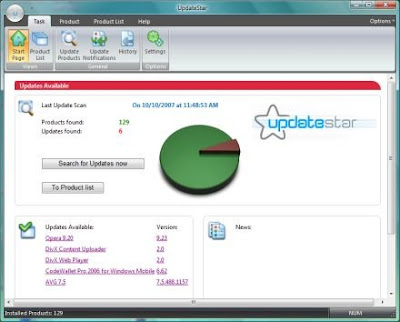 Stay up-to-date with your software: UpdateStar offers you a time-saving one-stop information place for your software setup and makes your computer experience more productive. Protect yourself against outdated Software! Old Software can lead to problems and system crashes. It can even leave you vulnerable to attacks from outside. UpdateStar puts a stop to all that! As soon as a new version is available, UpdateStar lets you know automatically, and you can download the update straight away! How to Split Large Files into Smaller Files ? need bpo jobs without a single rupee!!!!!!!! a genuine job from home. How To Extract Windows and Microsoft Office 2010 Product Key?